Almost 10 months after the media reported the alleged nexus between Venugopal Dhoot-promoted Videocon Group and Nupower Renewables Pvt Ltd of Deepak Kochhar, husband of then ICICI Bank MD and CEO Chanda Kochhar, the CBI has filed an FIR against the Kochhars, Dhoot and firms including Nupower Renewables and Videocon Industries for allegedly cheating ICICI Bank of Rs 1,730 crore until March 2012. The CBI has also named Supreme Energy Pvt Ltd, Videocon International Electronics Ltd (VIEL) and unknown public servants as accused in the case. It has alleged, “the accused (Chanda Kochhar) sanctioned certain loans to private companies in a criminal conspiracy with other accused to cheat ICICI Bank”. The case has been filed under sections of the Indian Penal Code and the Prevention of Corruption Act. On Thursday, a day after it registered the FIR, the CBI conducted searches at four locations — the Mumbai and Aurangabad offices of Videocon Group and offices of Nupower Renewables and Supreme Energy Pvt Ltd in Mumbai. The agency said it will investigate the role of current and former top ICICI Bank officials including Sandeep Bakshi, MD and CEO of the bank; its former chairman K V Kamath and members of the sanctioning committee of the bank NS Kannan, K Ramkumar, Sonjoy Chatterjee, Rajiv Sabharwal, Homi Khusrokhan and Zarin Daruwala. They will be probed in connection with sanctioning loans of Rs 1575 crore to Videocon Group that turned NPA “resulting in a wrongful gain to the borrowers and accused persons”. ICICI Bank and Chanda Kochhar have been under regulatory scrutiny after the media first reported on March 29, 2018 that Dhoot provided crores of rupees to a firm he had set up with Deepak Kochhar and two relatives six months after the Videocon Group got Rs 3,250 crore as loan from ICICI Bank in 2012 — on December 8, 2017, the CBI had registered a preliminary enquiry (PE) into the sanctioning of the loan. The amount was part of the Rs 40,000-crore loan that Videocon Group secured from a consortium of 20 banks led by SBI. Almost 86 per cent of the Rs 3,250 crore loan (Rs 2,810 crore) remained unpaid. The Videocon account was declared an NPA in 2017. 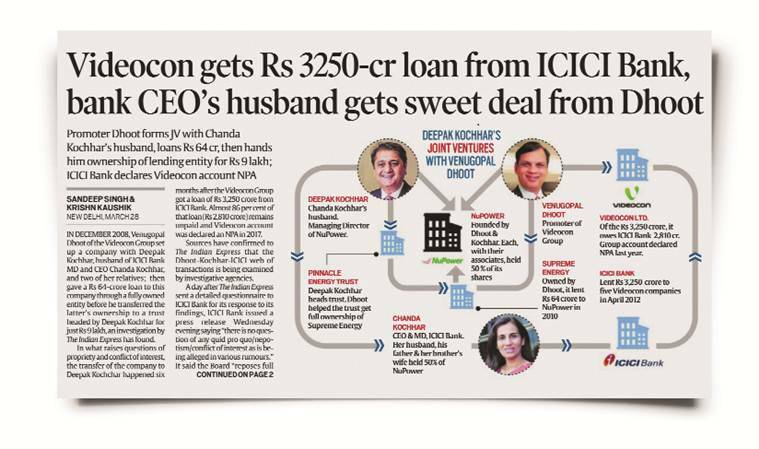 According to CBI, on August 26, 2009, the sanctioning committee of ICICI Bank that included Chanda Kochhar approved a loan of Rs 300 crore to Videocon International Electronics Ltd (VIEL) “in contravention of the rules and policy”. Kochhar, the CBI alleged, “dishonestly” abused her official position to disburse this loan on September 7, 2008, as the very next day, her husband’s firm Nupower Renewables received Rs 64 crore from Videocon Industries Ltd (VIL) to acquire its first power plant. “…Chanda Kochhar got illegal gratification/undue benefit through her husband from M/s VIL/VN Dhoot for sanctioning RTL (rupee term loan) of Rs 300 crore to M/s VIEL,” the agency said in its FIR. The fresh action by the CBI comes a week before an investigation report into various allegations against Chanda Kochhar and ICICI Bank is to be submitted by a panel headed by retired Supreme Court judge Justice B N Srikrishna. The mandate of the enquiry, instituted by the bank on May 30, 2018, is to probe a whistleblower complaint alleging non-adherence of the code of conduct, conflict of interest and quid pro quo by Chanda Kochhar while dealing “with certain borrowers” of the bank. “My report is independent of the CBI action. There has been no communication with the CBI on this issue. The final report will be submitted not before the end of this month,” Justice Srikrishna told The Indian Express Thursday. The CBI, in its FIR, said that rupee term loan sanctioned to five companies of Videocon Group between June 2009 and October 2011 were “in violation of the credit policy of the bank”. The five firms are Millenium Appliances India Ltd (Rs 175 crore), Sky Appliances Ltd (Rs 240 crore), Techno Electronics Ltd (Rs 110 crore), Applicomp India Ltd (Rs 300 crore) and Videocon Industries Ltd (Rs 750 crore). “Loans sanctioned to M/s SAL, M/s TEL and M/s AIL were for the purpose of enabling them to repay the unsecured loans availed by these companies from M/s VIL. Further, a loan was also sanctioned to M/s VIL for refinancing the existing loans of the company. These loans were sanctioned in violation of credit policy of the bank during the relevant period,” said the CBI FIR. The CBI said all the credit limits to Videocon Group firms were sanctioned after Kochhar took over as the MD and CEO of ICICI Bank in May 2009. The agency also said Kochhar was part of the sanctioning committee that approved at least two loans of Rs 300 crore and Rs 750 crore respectively to VIEL and VIL. On October 4, 2018, Kochhar resigned from her post at the bank. She had been on leave since June 18, 2018, pending the investigation by the Srikrishna panel.